UPDATE: MacBook Air battery tests are now available. On Thursday we ran some battery life tests to determine the impact that OS X 10.8 Mountain Lion had on the battery life of portable Macs. Using a 2011 15-inch MacBook Pro, we confirmed that 10.8 results in a serious degradation of usable battery life — in our case over 30 percent — and that the 10.8.1 update restored only about half of the lost battery life compared to the running time we could achieve on the same hardware in OS X Lion 10.7.4. We’re continuing to investigate the impact of the Mountain Lion battery life issue and we now have results from a new 2012 MacBook Pro with Retina Display (rMBP). Our 2011 MacBook Pro was a Mac that had been used for over a year and had a battery that, while still healthy, had quite a few cycles on it. In contrast, our rMBP is brand new and, aside from a battery calibration before starting the tests, has hardly been used. 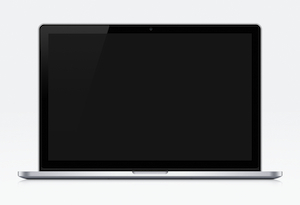 The rMBP is an upgraded base model, with the 2.7 GHz i7 CPU, 16 GB RAM, and a 256 GB Apple SSD. To recap from Thursday, our tests were performed by using a custom Automator application under battery-saving conditions: the screen at 50 percent brightness, keyboard illumination off, and all applications and services disabled except for WiFi. To keep the Mac running throughout the test, we disabled system and display sleep in System Preferences, and deactivated the screen saver. Open TextEdit, pause 10 seconds. Open Safari and navigate to a content-heavy website (macobserver.com), pause 20 seconds. Navigate to a second content-heavy website (cnn.com), pause 20 seconds. We initially saw some unexpected results — as we’ll explain later — so each test was run multiple times, and the results below are averaged. We’ve placed the results from the 2011 MBP in the chart as well, for the sake of comparison. Of note, although the first rMPBs shipped with 10.7.4, it was a unique build of Lion specific to that machine. Our rMBP shipped with 10.8, and we did not have access to the special 10.7.4 build to run a comparison test. 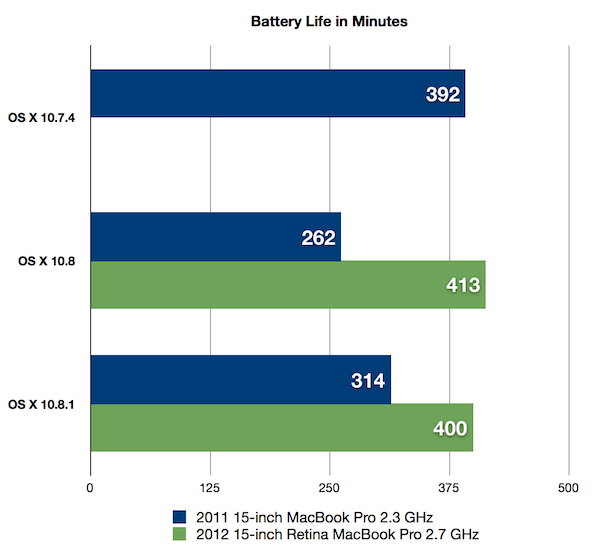 Therefore, our rMBP analysis is primarily focused on the difference in battery life between 10.8 and 10.8.1. The rMBP scored better than our 2011 MBP, but that was to be expected considering the more power-efficient components and architecture found on the newest member of Apple’s laptop family. What was surprising was that 10.8.1 brought no improvement in battery life on rMBP. In fact, as averaged on both 10.8.1 tests, the update resulted in slightly decreased running time compared to 10.8. 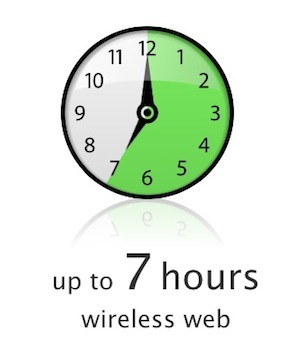 Apple advertises “up to 7 hours of wireless web” battery life for the rMBP, and our 6h 53m result on 10.8 is close enough to declare that the rMBP is operating normally. Even the slightly lower 6h 40m average for 10.8.1 is a good score compared to Apple’s advertised numbers. In light of our test results, it appears that the battery life issues associated with Mountain Lion are generally limited to traditional MacBooks. While we would have liked to have been able test 10.7.4 on the rMBP, Apple’s battery life estimates for the rMBP lead us to believe that there is no significant battery life issue for the rMBP on Mountain Lion. Customers interested in moving to a Retina Display Mac should therefore not be too concerned about degraded battery life. We are continuing to test other MacBook models, and we’ll have results from a 2011 13-inch MacBook Air on 10.7.4, 10.8, and 10.8.1 on Saturday.